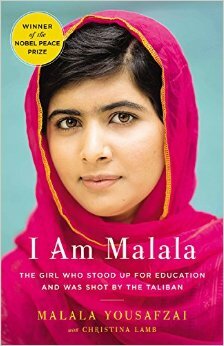 Summary: I am Malala: The Girl Who Stood Up for Education and was Shot by the Taliban, is by Malala Yousafzai, a young girl from Swat Valley, who is standing up for girls rights and education against the Taliban. I am Malala is an autobiography that describes the hardships of living under the Taliban, and the ways Malala herself stood up against their bans on the things that women could do, such as being educated. This book is her journey through her life that started peacefully without the Taliban, and then as the Taliban gains power how life changed and instead of doing as the Taliban wanted and keeping safe, she spoke up against the inequalities and stood up for women’s rights. It shows her dedication to a safer and educated world for not only girls, but boys as well. Not just children but adults. Even after being moved to England, she continues to fight for education. I thought this book was amazing because Malala was 12 year old girl that impacted the world so greatly and in such a positive way. It shows how a girl who doesn’t let go of her hopes and dreams can achieve so much, even though they are from a humble background. The book was very informative and encouraging. Malala talks about all the things that are going on as she struggles against the Taliban with her father and a few other outspoken individuals. I agree with Malala’s opinions, that every child and adult should be given an education because it is their right. No matter the gender of a person, people have a right to being informed, and it is crucial world that people are educated. A common theme is that people should be informed and educated. That people should have the rights that they deserve, rights that all people should have because they are human. I believe this book is encouraging and that it really shows a human face to this great international hero that Malala has become. It also shows the hardships that people face, living under the Taliban and breaks the many stereotypes that people have gained of Muslim people. I really liked this book, because Malala spoke out through this book to show people what was really going on in the Middle East. Many people have a very withdr awn perspective on what is going on in the Middle East. They don’t really understand what it is like to live there, but I am Malala can change this spectator view and show what is really going on. Living in America, or really anywhere not in the Middle East, it is hard to be able to “walk” in these people’s shoes. We don’t know what it’s like, but through Malala, we can understand. I would definitely recommend this to everyone. I believe that everyone should read this book, not just because of the ideas that Malala Yousafzai talks about, but also because it is an incredibly encouraging and life changing story. I picked up this book because I was curious to learn about Malala Yousafzai. It was wonderful to see someone my age, though at the time younger, to go through these hardships that she faced and still keep fighting for something that is so dear to her heart, and because of her struggles and her continuous efforts has changed the world for the better in so many ways. Malala Yousafzai’s tale is an encouraging tale, and I would recommend it to everyone. Malala’s story is sure to grab anyone’s attention, and it can really change a person’s perspective as well as help them make a difference in their own community. Summary: A marine who is sent into combat in Afghanistan without being told the horrors of war, realizes just how bad it is to be there to experience it. As he meets his squadron he learns that he is no longer a marine but rather a “Jarhead.” They call themselves Jarheads because they are seen as soldiers with nothing but an empty jar for a head which implies that they will do anything they’re told rather than thinking for themselves. Although he was a scout sniper and should have gotten plenty of kills, he did not. He had not killed a man in combat but he has seen some things that no one should ever have to see. The book ends as he is coming home to the U.S. He comes to see his family and his friends. He goes back to where he knows as home, only to find his girlfriend with her new man. This is a memoir written by the Jarhead himself, Anthony Swofford. Why I picked it up: I picked this book up because it looked interesting and the title was a bit peculiar so I decided that I would give it a try. Why I kept reading it: I kept reading the book because it continued to pull me in with intense life and death situations as well as scenes that had shown the effect war had on the soldiers. Who would I give it to next: I would recommend this book to anyone that is willing to read a true story about one our U.S. marines. I would only recommend this book to older and more mature viewers because of the content that resides within these pages. Besides that, I hope that anyone that picks this book up enjoys it. Summary: Three Cups of Tea by Greg Mortenson and David Oliver Relin illustrates a true story about the author, Greg Mortenson, and his journey to spread peace in the Middle East by building public schools for children. Mortenson firsts starts his journey by promising a nurmadhar, a chief, of a village that he would build a school for their children. This book shows the perpetual friendships Mortenson forged during his trips and demonstrates the distinctive culture and daily life style of the people in Pakistan. Why I picked it up: To be honest, I was required to pick a book for the enrichment reading program and one of books that was on the list of appropriate books was Three Cups of Tea. Why I kept reading: I kept reading this book because it was very inspirational and it provided me a window to see the different cultures and lifestyles of people living in Pakistan. And also because I wanted to pass World Core. Who I would give it to next: I would recommend this book to everyone especially for those who are interested about life and culture in Pakistan and for those who want to make a difference in the world. Survival in Auschwitz tells the story of a 25 year old Italian citizen that is taken by the Nazis because of his Jewish race. He must then learn to live a life working in the Jewish concentration camp “Auschwitz.” Here, they are forced to work to near death. Primo Levi weaves the theme of freedom and respect through each page. Levi was treated unfairly, with violence and hatred only because of his race, and was forced to work for his own freedom. This book is very unique in my eyes. It was extremely enlightening, as well as inspiring to read the story of this man who went through it all first-hand, and told his story. The author writes the story through his own experiences, so I agree with both of their opinions and views of the Holocaust and the concentration camps. As anyone who would have to survive through that, Levi felt that him being forced into the camp was unfair because although he was Jewish, he still was an Italian citizen. With that aside, he felt no one, Jewish race or not, should have to endure such torture with both the labor aspect, and leaving your family as well. This book is very one-sided, in the sense that it tells the story though the victim’s point of view. One thought that readers may question is the relationships between the camp members, and why they are so civil to each other. You might wonder, wouldn’t they be bitter without family, friends, or any comfort? Well each person arrived in that camp void of any comfort, so the only place they can find comfort is in each other if they build relationships. The only bad part is, soon after you may build a relationship, they can be forced to leave to the gas chambers, or sent to a different camp. Overall, I enjoyed this book very much. It really gave you a wide outlook on how bad Auschwitz was, and because the author endured it first-hand, the feelings and emotions come across even more personally. You will enjoy this book very much if you are looking for an inspiring book that will really make you open your eyes to see things differently. This is a very sad and funny book about a girl, named Ashley, that looses her parents and slowly separates from her brother. Ashley gets transferred from one family to another while the police are trying to figure out whether her mom can take Ashley or should they put her up for adoption. This book also tells of how Ashley feels over time as she starts to grow up. It must be harsh to learn the evils of the world at such a young age. She does some silly things at some families houses which add interest to the reading. The police choose to put her up for adoption in the end. She slowly starts to grow up and learn to stand on her own. I really enjoyed reading this book because it was amusing and at times I could relate to the authors view of things. This story is good reminder of the moral, if life gives you lemons, you make lemonade. If you like touching stories with a bit of humor then this is the story for you. Based on events from her own life, Smashed: Story of a Drunken Girlhood follows the journey of Koren Zailckas from her first sip of alcohol to her subsequent alcoholism. This novel chronicles her actions through this rocky period of time in her life and serves as a warning against teen drinking. Her story is a tragic example of the detrimental effect that alcohol has on teenagers and adults alike. Teen drinking is a common issue in society today, so I thought that it would be an interesting novel to read. I was pleasantly surprised with the reality of the novel. I enjoyed that Zailckas did not sugar coat the events that took place in her life. She has a very blunt writing style, which is seen through the course of the novel. Smashed is full of drama, and will certainly keep you on your toes. This novel has the ability to impact one’s way of thinking and causes the questioning of one’s judgment. The tone of this novel is mostly dark with themes of depression, fear, and insecurity. Overall, this is a fairly interesting novel. The story itself is pretty depressing, so I wouldn’t recommend it to those who want to read something light.